Nova Scotia is Latin for "New Scotland," and is the recognized name of the second smallest, but second most populous province in Canada. The first Europeans where French, and established the first European colony north of Florida back in the early 1600's. Nova Scotia became a strong bone of contention between Britain and France, and 6 wars where fought between Britain and France from the 1680's up to when Britain finally took control with the Treaty of Utrecht which saw France effectively cede control of all its lands in Canada. Nova Scotia was at the pointy end of many more conflicts, when during the War of 1812, Nova Scotian communities either built or purchased ships to fight in the conflict. One of the highlights was when HMS Shannon escorted the USS Chesapeake into Halifax harbour. 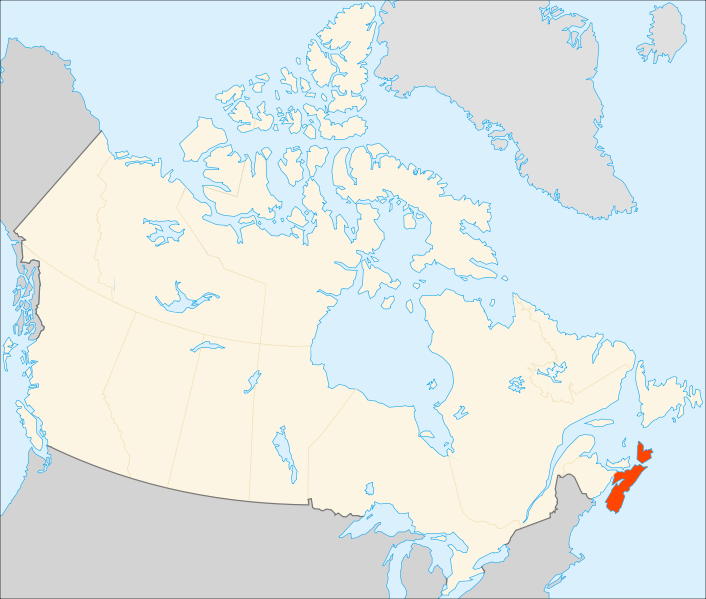 In 1848, Nova Scotia became the first of the Canadian territories to achieve self governance, and in 1867, along with the Province of Canada, and New Brunswick formed the new Canadian Confederation. The predecessor to what has now become the new Canada. Nova Scotia's coat of arms was granted by King Charles I in 1625, and is the oldest Coat of Arms granted outside Great Britain. And was granted for the first Scottish colony in Canada. The crest consists of 2 hands, clasped. One in a gauntlet, the other, naked. The gauntlet is holding a Scottish thistle, and the naked hand is holding a laurel for peace. The shield itself is a blue saltire on white. A simple reversal of the Scottish flag. In the centre is a second shield. This is the Royal arms of Scotland. A red rampant lion on gold. The compartment features thistles. Again, linking back to Scotland. As well as the Mayflower, the official flower of Nova Scotia itself. 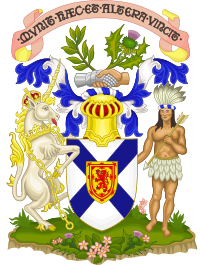 The supporters themselves are a unicorn, taken from the arms of Scotland, and a member of the Mi'kmaq. The people who are indigenous to Nova Scotia. 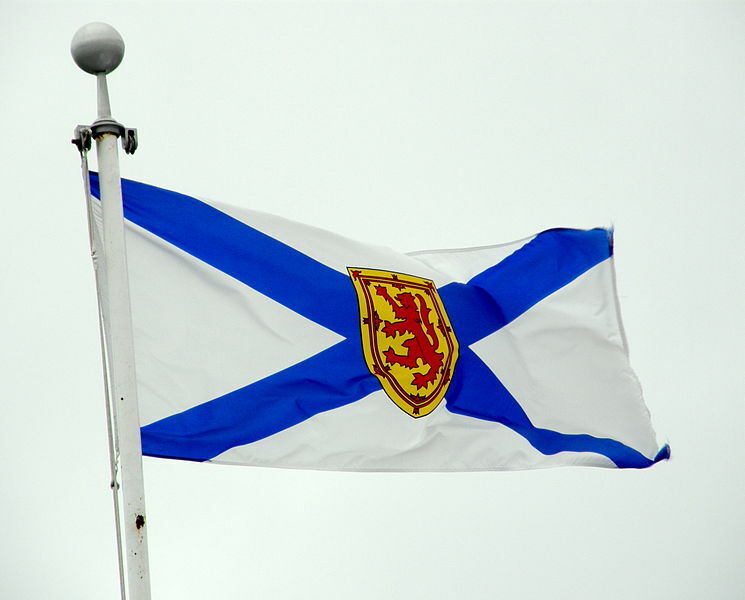 The current flag of Nova Scotia was instituted in 1858, only to be superseded by a red ensign design 10 years later. This carried a shield which was in use in Nova Scotia from 1867, to 1929, when the original banner and coat of arms where formally brought back. The shield was a gold colour, with 3 thistles. 2 up top, 1 under. A blue wavy line representing water cut across the middle, with a salmon representing an abundance of fish placed in its centre. 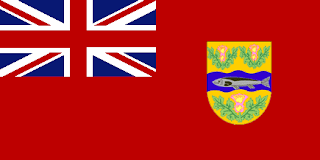 However, in 1929, the old arms and old flag where restored to prominence. The flag itself was created in 1858, and reverses the colours of the Scottish flag, making for a white flag, with a blue saltire. In the centre, they added the shield from the traditional arms of Scotland. A red lion rampant on a gold shield, edged with red fleur di lys. the shield is not traditionally carried on the Scottish blue saltire. 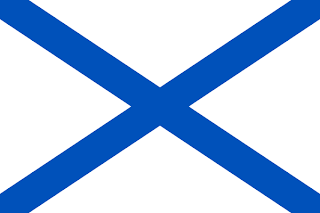 However, it was added to the Nova Scotian flag because the Russian Imperial Navy at the time used a simple blue saltire on white as its Naval ensign. Today, the flag is highly thought of. Ranking as it does, 12th the American Vexillological Associations survey of North American state and provincial flags! Thanks for providing the detail info about Nova Scotia flag.Nova Scotia flag provides a more visible contrast for the Scottish shield. Still, it's a classy flag.